A&A Aviation also has an on-site A&P Mechanic to keep the fleet of local airplanes safe and flying. Andy is the certified A&P and IA mechanic at A&A Aviation. 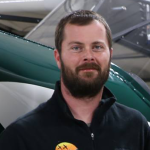 With over 16 years experience Andy has worked on a wide variety or aircraft, everything from Citation Jets to Piper Cubs. Whether it’s a one-time fix, oil change, or an annual inspection for your aircraft the rates at A&A Aviation are very competitive and the quality of work excellent. If you’d like more information on maintenance for your aircraft please call so we can provide you with a quote. Contact Andy directly at (303) 257-6415.